As a unique feature, the Alpha-A modular series is specified to cover an impedance range from 10-3 Ω .. 1015 Ω of 18 orders of magnitude (16 orders of magnitude for each test interface). This in combination with broad bandwidth and high accuracy makes the Alpha-A a powerful tool which can measure broadband and over a wide temperature range nearly all kind of materials within a single instrument without changing sample geometry or sample cells. A wide impedance range is one of the most important features of an impedance analyzer especially for broadband material analysis requiring both low and high frequencies. E.g. there is no use of an analyzer which can measure low frequencies in the mHz range but has an upper impedance limit of 100 MW for characterization of isolators or dielectrics, as the impedance limit will be exceeded at much higher frequencies like e.g. 100 Hz. 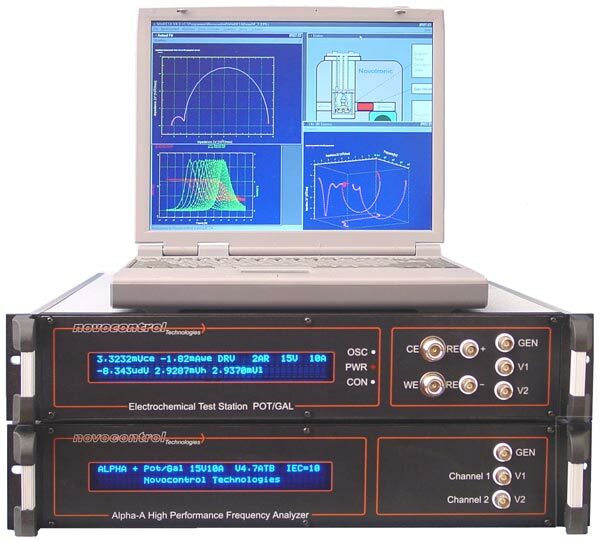 With exception of the Alpha and Beta series, usually different impedance analysis systems are used for impedance analysis of dielectric high insulating materials, semiconductors, and conducting systems like electrolytes or metals. This is because each system covers an impedance range optimized for its application. E.g. dielectric analysis systems have good performance for capacitive samples which have very high impedance in the TΩ range at low frequency. On the other hand, for semiconductors, electrolytes or metals impedance analyzers are used which operate from low to middle impedance (typically 10 mΩ .. 100 MΩ). The drawback of this concept is that the different material classes are generally not confined to a specific impedance range. E.g. for dielectrics, dc conductivity may cause low impedance and electrolytes or semiconductors may show high insulation. This is even likely to happen if the impedance spectra are measured broadband or/and in dependence of temperature. In this case, a material may be a good isolator at low temperatures but change into a strong conductor at higher temperatures due to thermally activated charge carries or a phase transition. As a result, many materials can neither be completely characterized by a typical dielectric system nor with an impedance analyzer for middle and low impedance. In practice, this situation is not artificial but rather standard. Depending on temperature and frequency the impedance limit of the analysis system is reached usually very soon. Measurement Examples of high and low impedance samples covering 18 orders of impedance magnitude in single diagram, example of a material used in thermo fuse with a change of 11 orders of impedance magnitude between 80 °C and 120 °C.